I have a MultiLineString vector layer from which I would like to calculate the length. I have tried to calculate the length with the Field Calculator by putting in the expression $length. 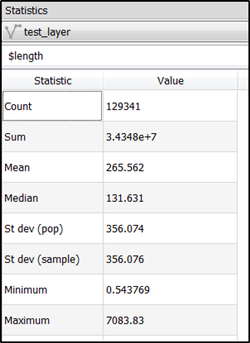 The problem is that the dataset is very big (the attribute table consists of about 700,000 features) and my computer or QGIS is not capable of calculating that (at least when using this approach). Any suggestions of other ways QGIS might be able to calculate the length and deal with the size of the data given the large number of features? Field calculator can be activated from Layer Properties window. It is on Fields tab (2.18) or Source Fields tab (3.0/3.2), which calculation is much faster than the one activated from the attribute table. One approach would be to split your line feature layer into multiple chunks, calculate the length for lines in each, then merge the split layer. 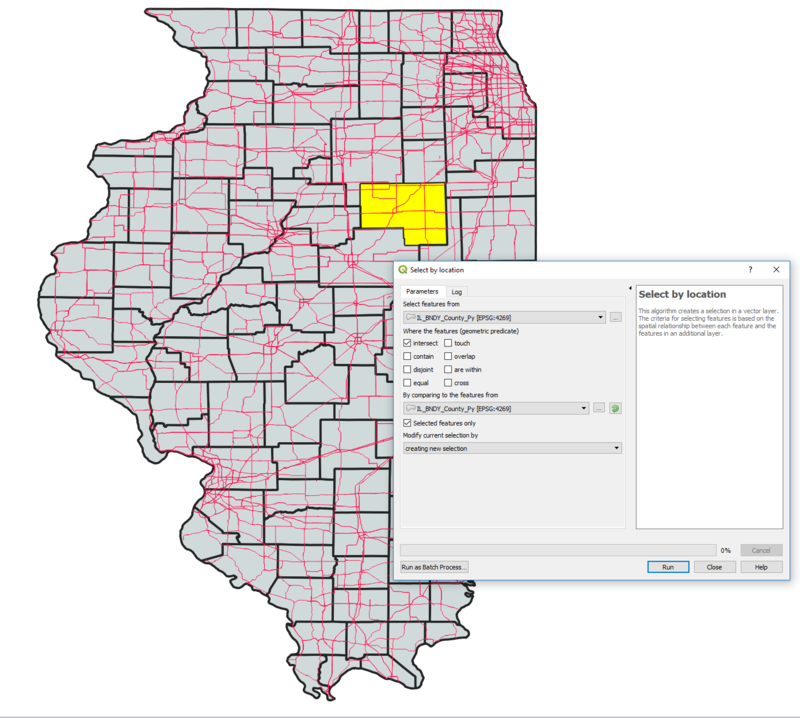 For example, you can clip your roads to individual polygons in an a shapefile of administrative boundaries (counties in the example below). Select from the menu Vector -> Geoprocessing tools -> Clip, and enable iterate over this layer option (green arrow button, circled below). Alternatively, you could use Select by Location to select line features that intersect individual polygon boundaries. 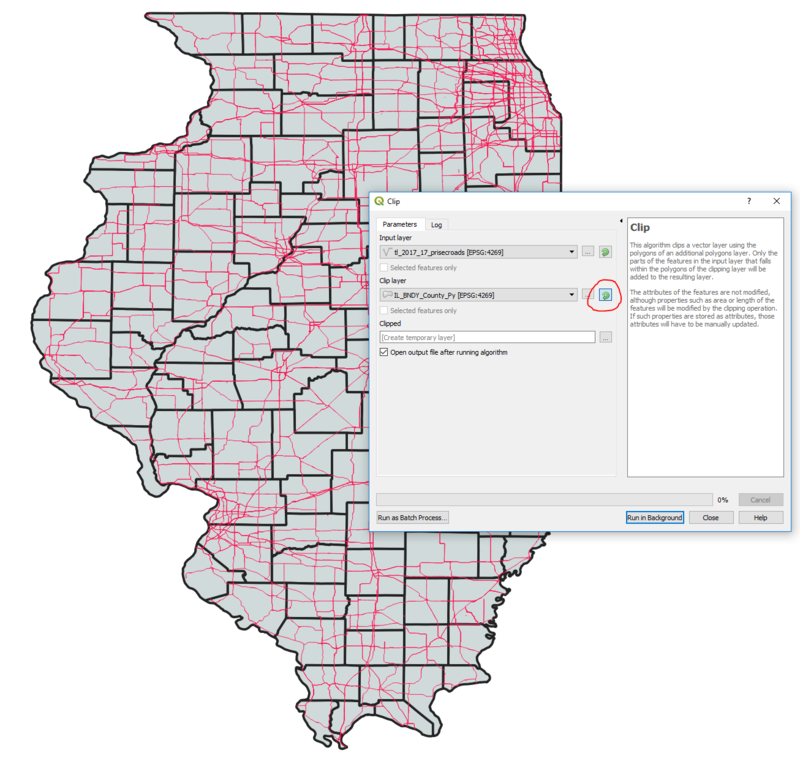 This may be desireable if you don't wish to split line features at administrative boundaries (i.e., if you want total length of lines that may fall in multiple polygons). Then run the $length calculation for selected subsets of the line layer. For such number of data, Qgis may hang while trying to calculate the length. If the roads are of different categories, I would suggest you calculate by the categories after which you merge the table results to have your data as whole. You can as well categorize by any other attribute feature that differentiates the roads, run each category separately and finally merge or join results. If you want to know the total length and some other statistics use the "Show statistical summary" tool. It has letter Sigma as an icon in the main toolbar. Not the answer you're looking for? Browse other questions tagged qgis vector line length big-data or ask your own question. Area calculation in QGIS done two different ways? How to sum attributes from different vector grids?